Whether Dave is expertly supporting large developers, designing and creating new communities or calmly mediating fence disputes between neighbours, he provides consistently high quality service to his clients, regardless of the scope of the project. He has successfully served Government clients, large and small developers and hundreds of local property owners. 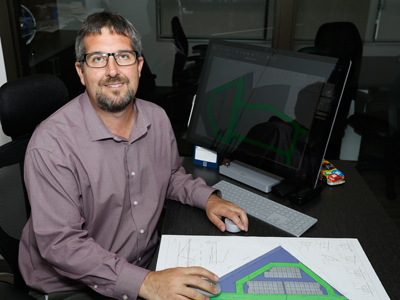 Dave’s expertise includes solving complex boundary issues, preparing subdivision plans, condominium plans and land severance applications. His experience includes survey control installations using GPS. His ability to navigate current technologies is a further asset to IBW. Dave is a longstanding resident of the Durham Region; as University of Toronto graduate in 1992, and an OLS since 1997, he has been surveying in the Durham Region for 20 years ago. He brings to Ivan B. Wallace Ltd. a vast array of local and international experience, including managing an office in Bermuda for several years. Since 2006, it has been a privilege to work with such an innovative and dynamic team at IBW; he is excited to be a part of such a dedicated and bright group of forward thinking professionals. Dave has been a valued Board member and Past President of the Rotary Club of Whitby since 2001. He particularly enjoys supporting hands on community based projects at local parks, Wind Reach Farm and the Santa Claus parade. Dave is also a contributing member of the Durham Home Builders’ Association. Dave’s life is kept very happy and busy with his two daughters and wife. One of his lifelong dreams is to sail around the BVIs while on vacation with his family.